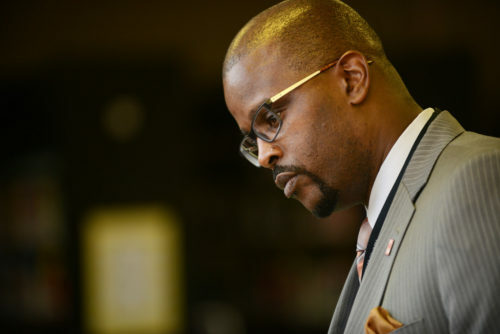 Antwan Wilson, the chancellor for D.C. Public Schools, agreed to leave his post last month after news broke that he had flouted his own school enrollment policy. Wilson sought to bypass the extremely competitive school lottery system in order to transfer his daughter to a higher-scoring school. The reaction from the city council and the public was harsh, swift and widespread. Having lost the support of his boss, Washington, D.C., Mayor Muriel Bowser, Wilson stepped down, eventually agreeing to a six-month severance package. Despite his position, Wilson did what an uncounted number of parents do daily: He sought to transfer his child to a higher-performing school. Public school superintendents are expected to enroll their children in their own school district to gain public trust. Wilson and his wife felt that the performing arts school his eldest child attended wasn't a good fit. The neighborhood school the Wilsons are zoned for only had 1 percent of its students meet math expectations on last year's standardized exam and 6 percent in reading. So Wilson's wife coordinated with the deputy mayor of education, Jennifer Niles, to transfer their daughter to Woodrow Wilson High School, popular in the district, which has 22 percent of its students meet expectations in math and 54 percent in reading. Wilson High has a waiting list of 639 families. Many consider it good parenting to lie, wield political power and circumvent rules if it gets your child into a "good" school. Wilson may have been given a pass - except that one of his first acts as chancellor was to draft stricter school enrollment guidelines to reduce fraud and bias. It was in part as a response to accusations that his predecessor, Kaya Henderson, shuttled children of influential parents into the district's higher-performing schools. Many urban districts have one - that exclusive school that everyone wants their kids to get into. They are often zoned in wealthy neighborhoods. And many of them have admissions criteria in which parental income could easily serve as a proxy. It's really hard to tell if the school is good or wealthy. Student achievement as measured by standardized tests is highly correlated with income, the neighborhood you live in, as well as the child's prior achievement. Meaning, researchers can predict test scores by how much a family earns, where they live and students' prior results on tests. There are other predictors, but those are clairvoyant. Researchers and parents reflexively conflate wealthy and good and associate diversity with failure. In doing so we mistake what really makes a good school: effective teachers, learning and a positive school community. And we are reluctant to see what benefits diversity can bring at scale. We have found ways to make wealthy enclaves the North Star of districts, either by creating zones in economically homogeneous neighborhoods or by using selective admissions tests. Schools that yield higher test scores by filtering out lower ones aren't really "good." Though, to be fair, if the magnet or selective schools magically went away, overall district outcomes wouldn't change that much. But their presence does reinforce a positive reputation, often unearned, that can lead to greater resources, such as unique academic offerings, student clubs and other social supports. Thus exclusivity indirectly rewards these schools. Worse, selective schools keep us from understanding what constitutes a good school. Teachers of low-income students could very well be more effective, but it's difficult to know, because our frame of success is corrupted by the steps we will take to crowd out undesirables. The call is loud for value-added measures, which consider student improvement over time as a dominant factor in school performance scores. The theory is that if we can properly measure students' growth, schools and teachers will be evaluated fairly and be put on a more level playing field. I would love to see more of these measures developed. But we need to stop kidding ourselves. Most of us don't want to create good schools through the development of quality teachers, prepared students and engaged families. And as Antwan Wilson's behavior demonstrates, none of us want our children to learn with someone who is perceived to slow down our kid's progress. Test scores are not so much for students as they are for parents. The reality is that middle- and upper-class parents want symbols of our social status. We need schools to act like the gated communities we live in, and school performance scores are one way of doing that. The real crime Wilson committed is that he modeled a behavior that cities desperately need to end. After decades of white flight to the suburbs, people are moving back to the urban core. Lower-income residents in certain neighborhoods feel the painful economic impact of rapid migration back to cities. Gentrification, congestion and the cultural changes they bring are disrupting historic communities in Washington, D.C., and other cities. This is an opportunity to take advantage of the new diversity, and to have public schools actually look like the public. We can have diverse, effective neighborhood schools. But parents must believe in ethics, and understand that the rules apply to them. Segregated communities have long used schools as weapons to maintain housing discrimination. However, wherever there is diversity, there's an opportunity to push back against the systems that create underfunded, low-performing schools. In addition to value-added measures, we can create metrics that discourage the socioeconomic and racial divides that help produce bad schools. Wilson was wrong. We should expect our school leaders to follow the rules, especially the rules they are instrumental in making. But how hypocritical does it make us to find fault with him, when he's doing the same thing we are? What made Bruce Rauner's clouting of his unqualified daughter into Payton High School all the more outrageous, besides his constant lying about it, was that he wasn't even "saving her" from a low-performing school; instead, it was that she didn't want to go to her hometown New Trier High School, only reputedly one of the best in the country.